Restaurant depot parking lot had no parking. MY helper in shopping for the Hunger Run said “why are so many people here, are things free today”. i replied, “no, we are late to Rayaan’s Birthday party”. Around 12:30, i arrived at the residence of Erum and Shazad Shakir in East Brunswick. Salaam Uncle, Erum and Shazad Shakir greeted me with a joy on there faces, “please joins us for lunch before we unload the Hunger Van”. As i am eating, 7 year old Rayaan walks up to me and asks. “Do you remember me, I helped in making sandwiches for homeless, its my birthday and i will do it again with my friends today”. Erum, Shazad and Rayaan Shakir on 7th birthday of Rayaan started a new trend in birthday parties. More than sixty children and their parents made 300 plus meals to go. 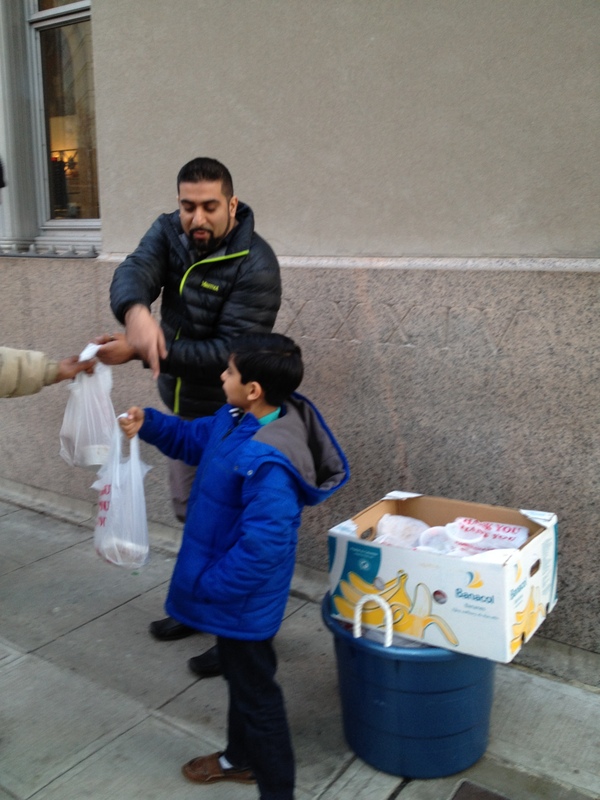 Rayaan and his dad Shazad Shakir followed me to Newark Penn station to distribute the meals. Click the link below to see 7 year old Rayaan and his friends in action.